Shinwa Express Vol.150 for Application[allethrin〜Purity test (4) Toluene〜] using Sunpak-H ~Part 1~. Shinwa Express Vol.149 for Application[Carteolol hydrochloride] using ES-PhCD-T.
Shinwa Express Vol.A17 for ULTRON ES-HILIC-CD(HT). Shinwa Express Vol.148 for Application[o-dichlorobenzene] using Shinwasorb. Shinwa Express Vol.147 for Application[2-Phenoxypropionic acid] using ES-OVM. for GC Capillaly Columns and GC Supports. 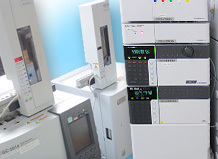 for High Performance Liquid Chromatography Columns.